WEST POINT, Miss. 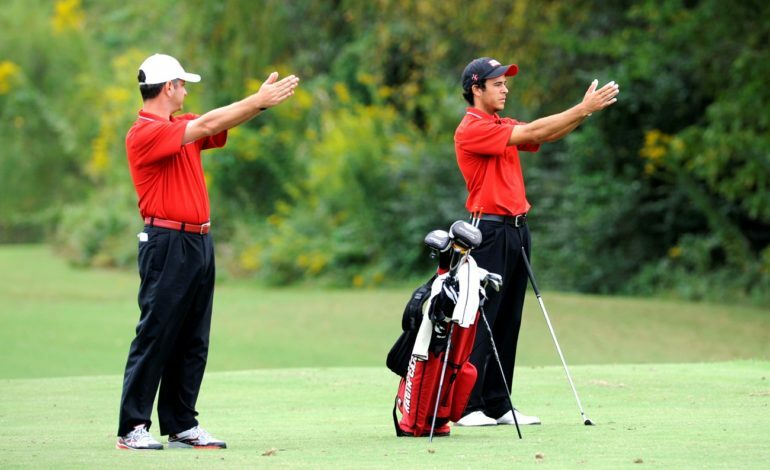 – The freshman tandem of Hudson Dubinski and Charlie Flynn each carded the team low scores in their respective rounds and the Louisiana Ragin’ Cajuns golf team finished in 10th place after the first day of the 2019 Old Waverly Collegiate Championship on Monday at the Old Waverly Golf Club. The final 18 holes of the 54-hole tournament will start at 8 a.m., on Tuesday on the par-72, 7,000-yard course. Louisiana, which will be paired in the final round with Louisiana Tech and South Dakota., will tee off beginning at 8:50 a.m., from the No. 10 tee. Dubinski led the Ragin’ Cajuns in the opening round, carding his first career round in the 60’s, finishing at 3-under 69. Starting at No. 10, Dubinski made the turn at 1-over 37 before scorching the front nine at 4-under 32 which was capped by an eagle on the par-5, 552-yard No. 9. Flynn, who opened the day with a 5-over 77, came back in the afternoon to finish with a 2-under 70 and posted a 36-hole score of 3-over 147. The freshman carded three birdies on back nine, enroute to a 3-under 33, before capping off his day with a birdie at No. 6. Flynn (77-70-147), Micah Goulas (73-75-148) and Peter Hinnant (71-77-148) led Louisiana, which posted a 36-hole score of 11-over par 587. Dubinski (69-82-151) and Jack Tolson (77-75-152) rounded out the lineup for the Ragin’ Cajuns in the 15-team field. ULM claimed the first-day lead after posting rounds of 278 and 276 to finish at 554. No. 4-ranked Vanderbilt was seven strokes back at 561 followed by Ole Miss (562), Little Rock (563) and Middle Tennessee (566). Marcus Byrd of Middle Tennessee claimed the lead after the first day, firing a 6-under 66 to take a one-stroke lead over Patrick Martin of Vanderbilt and Justin Warren of Little Rock. 1. ULM 278-276-554; 2. Vanderbilt 283-278-561; 3. Ole Miss 284-278-562; 4. Little Rock 280-283-563; 5. Middle Tennessee 283-283-566; 6. Mississippi State 284-284-568; 7. Chattanooga 287-284-571; 8. South Alabama 293-282-575; 9. Memphis 288-290-578; 10. Louisiana 290-297-587; 11. Louisiana Tech 301-287-588; 12. South Dakota 295-294-589; 13. Lipscomb 297-297-594; 14. Southern Miss 304-297-601; 15. Bradley 302-303-605. T43. Charlie Flynn 77-70-147; T49. Micah Goulas 73-75-148; T49. Peter Hinnant 71-77-148; T68. Hudson Dubinski 69-82-151; 70. Jack Tolson 77-75-152.